Tactical Urbanism is occurring globally in communities large and small. The impetus is simple, connecting and supporting local community through empowering people to create and activate the urban areas around their properties. In a world where we define our homes by property boundaries only, this movement seeks to redefine our understanding of the land and our communities role in it. Residents in Geelong’s northern suburbs have come together to create an event in support of local community in Labuan Square, Norlane. The square and local shopping area will be filled with activities and groups supporting local residents to live healthily and create new business ideas through a start-up business hub, a local food swap of backyard produce, backyard gardening and chook workshops, art activities cycling and walking maps, and much more. Labuan Square has been an important central spot for local community that has slowly deteriorated over the years. However recent interest in the ‘Square’ has led to a number of festivals and community projects in recent years including a number of mural art pieces facilitated by local artist Laura Alice. Current retailers and owners of vacant shops in Labuan Square are keen to see the area revitalized, with a number of shop owners providing vacant shop for the community event. Community groups, local artists, poets and street performers will activate the space supported by local business, council and the Geelong Better Block (GBB) volunteer crew. The GBB volunteers are local community with a passion for developing a more sustainable city and stronger regional economy. 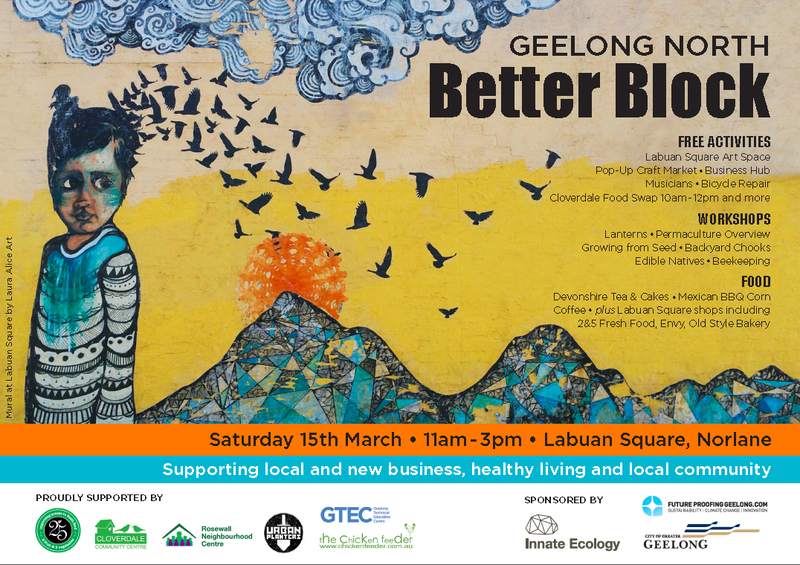 A Geelong Better Block event was held in June 2013, the first in Australia, attracting over 700 visitors. Located in central Geelong the event helped to empower community to own the street and create events for community to talk about and share ideas on sustainable living, efficient housing, safe cycling access and growing your own foods. ‘With this Better Block in Norlane we are seeing greater interest from local residents and community in supporting new business ideas, celebration through local art and music, food swaps and sharing ideas on growing your own food.” said Suzette Jackson, Geelong Better Block coordinator. We will have a business hub open on the day for residents to obtain advice to assist with business start-ups run by Enterprise Geelong. We also have a pop up craft market for people just starting out in setting up their own craft business and wanting to test their ideas. The Geelong Northern Suburbs Local Food Map, an initiative of local social enterprise Two and Five, will be launched on the day also. The fold-out map locates where to find places within the northern suburbs to ‘grow, cook, swap, shop’ with local fresh food, supporting local producers and local business. “The map is an important piece of who ‘Two and Five’ are as a local social enterprise. We are here to support local community in learning how to grow, how to preserve and access fresh local foods,” explained Two and Five manager Katie Drummond – Gillet. The Geelong North Better Block is a fun community event that will include local musicians, artists, children’s activities, a pop-up craft stall and more. The edible garden workshops include permaculture, growing from seedlings, backyard chooks and edible native plants. Locally made up-cycled seating and bicycle racks will be used and residents and cycling groups are encouraged to ride to the event. Bicycle repair information will be available on the day as well as a short bike ride to the Corio Bay Inner harbor led by Cycling Geelong & Queenscliff Men’s Shed members. Local community groups will have information at the event on the day for people interested. The event promotes safe cycling and walkable communities, encouraging a transition to a healthy and sustainable Geelong. Geelong North Better Block is supported by council, community and business including Cloverdale Community Centre, Rosewall Neighborhood Centre, Diversitat, Future Proofing Geelong, The Fort, City of Greater Geelong, Geelong Technical Education Centre, 2&5 Fresh Foods, The Pulse, The Chicken Feeder, Urban Planter, Cycling Geelong, Geelong Arts Alliance, Cloverdale Food Swap, Tree Project, Innate Ecology and local artists and craft makers.